I feel like this week is my summer vacay. Like I’m done with school and am home for the summer, if the summer was just one week. But you see, I’ve got this list in my head! Like, I need to bake with my sour cherries, and make cookies, and burgers, and shortcakes, and (more) ice cream, and pancakes. But, ya know, sometimes you have to throw that list out the window and get spontaneous late lunch with your brotha from anotha motha. You just have to have a couple beers with your short rib grilled cheese, and then hang out in the backyard, practice hula hoop skills, and then order pizza. Sometimes it’s all about going for night walks, and skipping out on your to-do list. Oh, and it’s about eating ice cream. It’s always about ice cream. So, I’ve been pretty much dying to put goat cheese in ice cream. I mean, I put it on everything else, right? Tacos, pizza, sandwiches, eggs, and of course in crepes with jam or even in these tarts. But you guys, it’s even better than I imagined. This ice cream (Whoops, just typed “dream” instead of cream, no joke.) tastes EXACTLY like blueberry cheesecake. And it’s a total hottie! 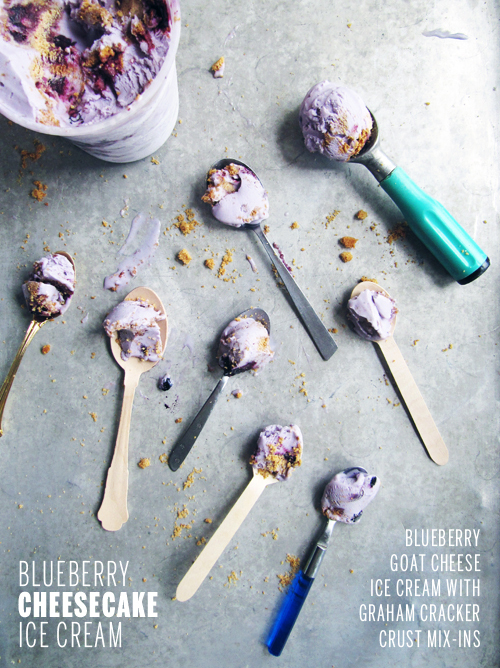 It’s blueberry o’clock, and it’s always goat cheese thirty. So let’s do this! Make compote. Heat sugar and berries in a small saucepan, and bring to a boil. Mash gently with the back of a spoon. Stir to dissolve sugar. Remove from heat and set aside to cool. Cover and chill until time to use. Make crust. Preheat the oven to 350 degrees F. Stir the butter and sugar into the graham crackers until all of the crumbs are coated. Press onto a parchment lined baking sheet into a single layer about 1/4 inch thick. Bake for 10 minutes or until golden brown. Cool completely before crumbling. Once cooled, crumble and place in a zip top bag in the freezer. Make ice cream. Mix about 2 tablespoons of milk with the cornstarch in a small bowl to create a smooth slurry. In a large bowl, whisk the goat cheese, cream cheese, and salt together. Combine the remaining milk, cream, sugar, and corn syrup in a 4-quart saucepan. Bring to a rolling boil over medium-high heat and boil for 4 minutes. Remove from heat and gradually whisk in the cornstarch slurry. Bring the mixture back to a boil over medium-high heat until slightly thickened, about 1 minute. Gradually whisk the hot milk mixture into the cream cheese mixture until smooth. Whisk in half of the blueberry compote. Cover bowl with plastic wrap and chill over night. Churn, baby churn. Churn your ice cream according to your ice cream maker’s instructions. 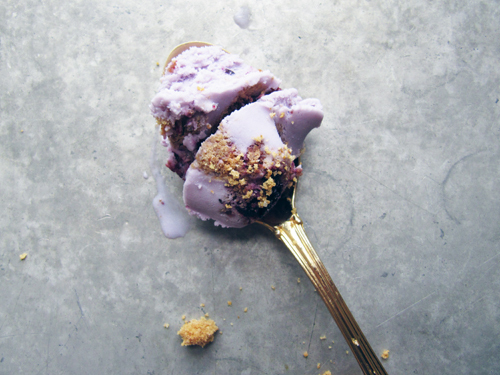 Once churned layer in an air-tight container with the remaining compote and crumbs. (Like this.) Freeze for 4 hours. Scoop and serve! 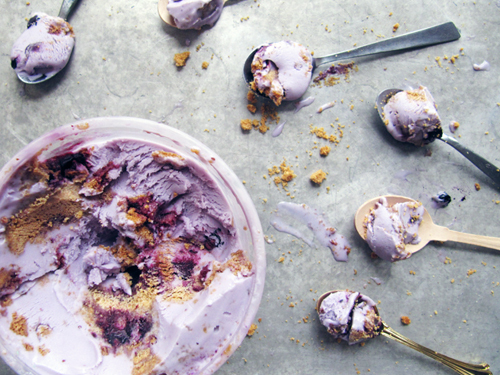 This ice cream is a totally the perfect summer fling. I love your vision of summer–hula hoops, short ribs, and pizza. Sounds like bliss to me! 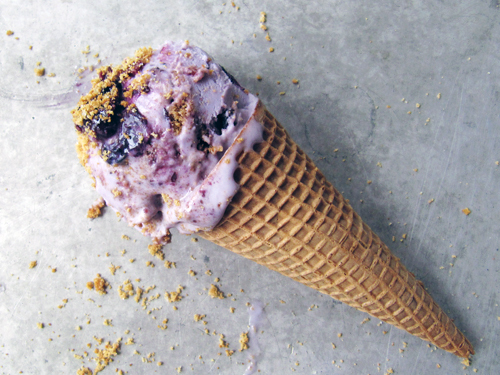 I can’t wait to try this ice cream because anything with goat cheese is a good thing. And sour cherries–bless dear Michigan. I’m excited to see how you cook them (I’m a little nervous to play around with them). Thanks, Amy! I’m so glad you also love goat cheese. It just makes everything better, ya know? I recently picked up Jeni’s Ice Cream At Home cookbook and I feel much better about life knowing that it’s Megs approved. It’s so inspiring! I mean, she makes some crazy-awesome flavor combos. Can’t wait to see what you make! hell yes! that ice cream is a beauty queen! way to know how to vacay at home like a pro! Yes!! This ice cream is amazing. I LOVE it SO much!! Good grief I need to make this! Ice dream. This is my ice dream. WANT. Grrrrrrl, I wish I could mail you an ice cream cone. I love everything about this recipe but the goat cheese. Can I just leave out or a suggestion on a replacement cheese for it? You could probably just use cream cheese instead. I haven’t done it before, but it’s a similar consistency to goat cheese. If you do it, let me know! I bet it would be super tasty! This sounds ah-mazing! I need to get over my fear of making ice cream. It’s so intimidating! This looks amazingly delish and I am excited to feature it on my blog today! I hope you will stop by for a visit. Hi! I’m so happy I ran across this on Pinterest. My ice cream is in the fridge for the overnight cool down, but I had to get back on here to say that the base of this is quite possibly the best thing I’ve ever put in my mouth! Amazing! I did make two subs that I thought I’d share with you… I used coconut sugar instead of reg. granulated and honey instead of corn syrup. No idea if it will set up the same, but we are trying out cutting refined sugars. Coconut sugar is my, and my coffee’s, new best friend. Speaking of best friends… I am making this to give to my best friend at her birthday party tomorrow night. I’m pretty sure she’s going to adore it! If it survives until tomorrow night. :o) Thanks again!